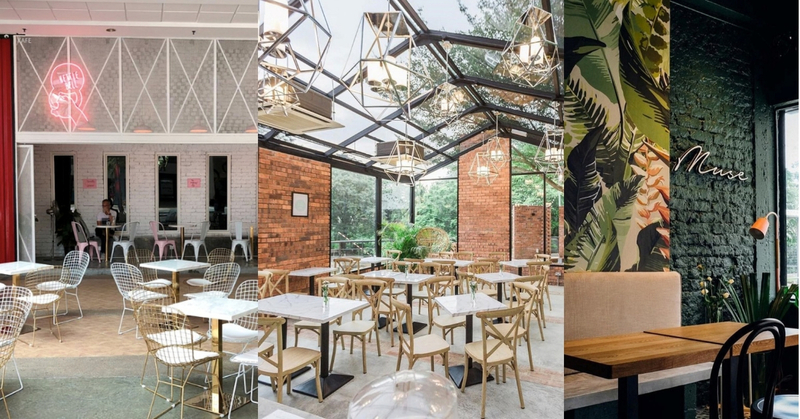 From Bingsu to pearl milk tea cakes and pizzas, Malaysia’s scene of cafés has been stepping up their game, showing no signs of slowing down in the evolvement department. This makes it all the more difficult to choose a spot for the best photos or brunches, when you’re hanging out with your friends. But don’t panic, we’ve got you covered with a list of cafes that we think you should check out! Referred as the accidental child between The Social Group and Dr.INC comes Lisette’s Café and Bakery. A homely space with colorful murals and offerings of delicious and nutritious eats and golden brown deliciousness, with the occasional splash of nature in every corner. Lisette’s take pride on delivering healthy yet scrumptious food, so keep in mind that they mostly serve vegetarian and vegan dishes, with a few meat options. We recommend trying their brunch spread usually occurring on Sundays, Tuesdays and Fridays. For more info, check out their Facebook page and menu. Hunter green and mustard brick walls with a touch of pink and neon, Happy Mansion proud presents its newest instalment, Muse Eatery, with a Western style of menu ranging from Crab cakes to Seared Sea bass. Along with some Asian options with a twist, we recommend giving their Har Joing Kai burger a try for a pleasant surprise, deep-fried chicken that’s been marinated in shrimp paste and placed in between toasted buns. And have desserts if you feel up to it, like their Signature Burnt Cheesecake which tastes similar to a Japanese style cheesecake with a caramelized top-exterior. Others dream of it, we bake it happen. . . Presenting our Signature Burnt Cheesecake 🧀 The whole cake is available for pre-order 3 days in advance! Kettlebell is a tiny café stationed right next to a gym (Firestation Fit 2 Mont Kiara), that provides balanced meals for post-workouts. With marble-tables and pastel pink hues, this café definitely garners some major Insta-worthy points. Dine and bask in the natural light at Pokok in a European glasshouse-style café. Outdoor seating is also available, which is filled with greenery that provides a very vast and calming feel to it so diners can enjoy the serene view while going to town with their meals. For more info, head on to their website and Facebook page. From the owners of Wild Sheep Chase, Catcher in The Rye is a new coffee and ice-cream venture allowing the owners to explore foods made with the freshest ingredients, along with their popular items from the Wild Sheep Chase menu, like their soufflés and coffees. Their minimal theme with tiles and greens make it a perfect blank-canvas spot for photos. For more info, check out their website and Facebook page. From Georgetown to Bangsar, Penang’s Western-Australian influenced café is now hitting the scenes of KL’s café brunch scene with a bang, serving dishes to us with beautifully plated food, so pretty, that you’ll be eating it cold by the time you’ve finished taking photos of your order. What's cookin'? Come over to our Bangsar branch for some fine breakfast and coffee with your friends! 📍 11, Jalan Telawi 5, Bangsar. 🕑 Opens daily except Tuesday, 8:00 a.m. – 9:30 p.m.
A NEW cafe in Bangsar Village!! . Sometimes the best corner is at somewhere you never thought it would work like here, the “restroom” because it’s usually tight in space and lack of natural lighting but I’m glad that I still managed to squeeze into the tight space. Also, I have so much love for the greeneries here / 🌿📸💯❤️ . . #coffeemeetbojio #fujifilmmy #fujifilmxt30 . P/s: First photo posted taken with my new camera X-T30. Hehe / 📸 . If you’ve ever had a taste of KL’s cronuts, then Dotty’s Pastries and Coffee will be no stranger to you, Le Petit Dotty’s deemed as mini verson of Dotty’s, serving you the best cronuts and croissants in KL, is a great place for you and your friends to chit-chat and catch-up over tea and sweets. For more info, check out their website and menu. Hokkaido-style curry soup restaurant with some Tumblr-Pinterest decorations and aesthetic meals that will make Instagrammers kneel before this place. Cureé is a place you won’t want to miss. Goddess of curry 🥘 _ *Friendly reminder: We are closed on Wednesdays. 𝘞𝘦 𝘵𝘢𝘬𝘦 𝘤𝘶𝘳𝘦𝘦 𝘰𝘧 𝘸𝘩𝘢𝘵 𝘸𝘦 𝘧𝘦𝘦𝘥 𝘺𝘰𝘶. _ We look after our ingredients, everything is cooked fresh, nothing artificial. Because your belly is sacred. _ *Warm reminder: Our signature Hokkaido Style Soup Curry serves during lunch (12-3pm) and dinner (6-11pm) only. Make sure you come over with an empty stomach! For healthy eating like Chicken Paleo Burger or Gluten-free Banana Cake and Instagrammable vertical-gardens, head on to Awesome Canteen. The dim-tinged café packed with awesome punches of balanced meals that will surprise you, and nostalgic décor of a Malaysian primary-school canteen are a great combo as a place for you to catch-up with your friends and not have the guilt on consuming sinful delights. Your prayers of temporary escape and a moment of peace and quiet from a noisy life, has been answered! With Bukku Cafe, a quaint yet cozy hub located at a quiet spot of Setia Alam. BUKKU Cafe provides amazing breakfast foods and healthy choices that will make you feel less guilty, as you get your morning-coffee fix or complete that last minute assignment. What’s even better is that this café is photogenic, as well as comforting. You get the best of both worlds! Tag a friend who’s been running out of places to café-hop!